The Rainbow Six Siege E3 unveiling was an astonishingly brutal assault on both an average suburban home and everyone’s expectations. Considered by many as the star of the show, until now we’ve only been witness to a single round of Siege’s signature multiplayer mode. Until now, that is. Last night Ubisoft ran a live stream where two teams proceeded to blast each other to smithereens over the course of six matches. Whilst they were all fought on the familiar family home map, the prolonged footage gives us a good insight into the small complexities of the game. Each match starts with a minute of preparation time, in which the Rainbow team can send in scout drones to look at the terrorist’s defences and discover the location of the hostage. Whilst Team Rainbow search the premises, the terrorists are busy erecting wall defences to prevent bullets from penetrating the walls, trailing barbed wire around the hallways, and nailing shutters to the windows. It appears each terrorist comes equipped with two wall defences, two spools of barbed wire, and as many window defences as needed. 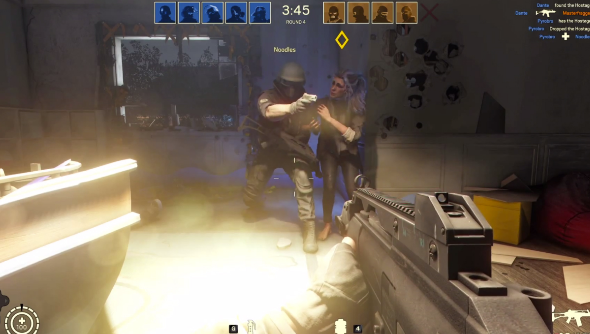 Eagled eyed terrorists can also shoot Rainbow’s drones in this phase, blinding them and preventing them from knowing where the hostage is in advance. When the counter hits zero the mission starts, and Rainbow can insert from one of two locations. Repel lines can be fired up from the ground to allow access to the second floor, but upsettingly there seems to be no glass in any of the windows so you won’t be able to do that dramatic crashing through the window move. With a permadeath element reminiscent of classic Counter Strike, the constant boom of the player count certainly seems to help ratchet the tension. Deaths are not discretely announced in the points log, but rather a key element of the HUD that constantly reminds you that your chances of success are being whittled away with every kill the enemy scores. The defenders seem to have the advantage with their wall blocks and window shutters, but attackers do have a great selection of weapons available to turn the tide. C4 breach charges can destroy everything, be it walls or floors, which allows creative approaches to situations. Terrorists on the floor below? Just blow out the floor and jump down rather than sprinting for the stairs. And the destruction looks every bit as good and dynamic as it sounds. Disappointingly there’s not as much perforated plasterboard in this demo as there was at E3, but this is probably due to the fact the players spend most of their time shooting the enemies and not the walls. Still, doors and window defences seem to shatter nicely under gunfire. What do you make of the footage? Does seeing it in a more natural, slightly less scripted environment help convince you of its credentials?